Sooooooo happy its Friday. Here is 5 awesome things from the week. 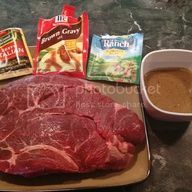 I made the ranch/Italian dressing roast that is all over pinterest this week. The girls love it. Its become a kid favorite. 2. Walmart started selling my favorite brand of nail polish and I am now 5 bottles richer. I hate living in a town where my only shopping choice is walmart. Although I should be grateful there are actually counties around me that don't even have WalMart. 3. Abbey has her first ballgame tonight marching with the highschool. I am so proud of her. 5. We are going to the zoo. I love the zoo. The polar bears are my faves. We are also going to the art museum. WoooHooo. I am so excited. Also I guess it goes without saying its a long weekend. Boy am I excited about laying around in my pj's all day Monday. I've really been meaning to take my kids to the zoo. It seems like every time I have the thought it's over 100 degrees outside!! Hopefully soon! Me too but I've decided this is the weekend. Abbey starts band competitions next weekend so its now or wait another year.